Check the Ramona Sentinel every week on Thursday (today) for the weekly Restaurant Guide to help you find weekly deals and specials. The Ramona Sentinel has been Ramona’s newspaper since 1886 and is freely located throughout the community. If you are visiting or didn’t get yours, this week, then stop by the local Chamber of Commerce office, at the corner of 10th and Main, or the Ramona Sentinel’s office at 425-a 10th Street. Check out ramonaevents.com maps section for a map of local restaurants that you can filter by style of food. Each restaurant’s detail listing will give you links to the restaurant websites, yelp and if we have a review by Dan Edwards, in our restaurant review section, you’ll find that, too! Here are this week’s deals to give you an idea. Tracy is a long-time Ramona resident, local businessowner and volunteer, active in service work to benefit the community of Ramona and her professional community. Most notably in Ramona, Tracy is active with the Ramona Skatepark Champions. 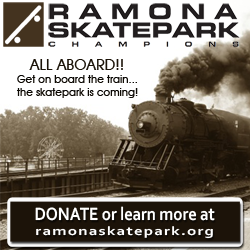 Please help build a skatepark in Ramona by donating at www.ramonaskatepark.org.